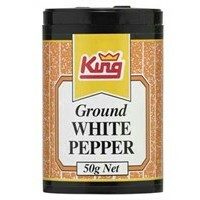 Ground white pepper offers a subtle yet complex earthy flavour. Often praised for its aesthetic appeal, ideal to use during or after the cooking process. King Ground White Pepper consists of only the peppercorn seed, the peppercorn is allowed to fully ripen, once ripened the outer skin is removed, allowing the remaining white peppercorn to be dried and ground.